in the Northeastern Indian state of Sikkim. The name Samdruptse literally translates to ‘Wish fulfilling hill’ (Bhutia Language). This majestic hill houses a grand statue of Guru Rinpoche (the great saint of Sikkim) which is supposed to be the tallest statue of the great saint in the entire globe. Considering it as a place where wishes are fulfilled, thousands and thousands of people has been visiting the hills and the nearby statue as a sacred place for devotion though the hill in which it is placed is believed to be a place of dormant volcano. According to the legend, many Buddhists monks pray the hill so as to prevent the volcano from eruption. 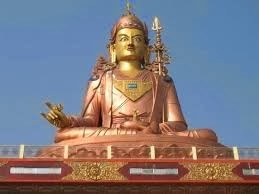 Statue of Guru Padmasambhava: Installed at the top of the hill, the statue of Guru Padmasambhava also known as Guru Rinpoche is 135 feet tall statue. The foundation stone of this statue was laid out by His Holiness Dalai Lama in 1997 AD and the construction work was completed in the month of February in 2004 AD. Since then it has been attracting a hordes of Buddhist people along with several tourist visitor making it one of the major attraction of Namchi town. This statue is an architectural marvel in terms of engineering as it has been installed at the top of the hill. The elegance and the delicateness of the statue which is adorned with an artist genius are remarkable. From a distance, this majestic statue seems like a golden cone of beauty and elegance set amidst the forest of the hill. The view is totally mesmerizing owing to the scenic beauty of the hills which is adorned with number of trees and carpeted grass. Visitors can also witness an astounding view of both dusk and dawn from this place which is truly a majestic sight to feast your eyes. Best time to Visit: The best time to visit this place is from the month of February to May and September to mid December. Accommodation: As Namchi is a booming tourist place, large number of hotels and resorts with all the modern facilities and services are available. Tourists visiting to this hill can opt to stay in hotels like Hotel Darjeeling Palace (2 star), Hotel; Broadway (3 star), Sanderling (2 star) and Hotel Summit Grace resort and Spa (4 star) which are festooned with all the amenities that is required for a comfortable stay. Closest Airport: The closest airport is Bagdogra Airport at an expanse of 124 km from Gangtok. Closest Train Station: The nearest railway station is New Jalpaiguri railway Station (NJP) 125 km. Siliguri Junction (115 km) is another railhead, but majority of trains don’t stops there. By Road: Once you reach Gangtok (the capital of Sikkim), you can reach Namchi (74 km) by renting a vehicle or by getting on a bus. Buses and taxis also ply from Yuksom and Pelling to reach Namchi. Authorship © 2013 Sunny Thomas and Blogger Templates - Anime Soundtrack.